The National Judicial Council (NJC) has asked the Supreme Court to determine who between it and state governors have disciplinary powers over judicial officers. The prayer of the Council is contained in motion on notice it filed for extension of time within which to seek leave to appeal against the judgement of the Akure Division of the Court of Appeal, which held that it (NJC) acted beyond its powers by removing the name of the former Chief Judge of Ekiti State, Justice Kayode Bamisile (rtd), from the payroll and treating him as having ceased to be a judicial officer. The Council had, at its emergency meeting held in Abuja on December 20, 2006 and pursuant to the powers vested on it by Paragraph 21(d) of the Third Schedule to the 1999 Constitution, suspended, with immediate effect, the Chief Judges of Anambra, Plateau and Ekiti states for the partisan roles played in the impeachment in their respective state assemblies. Those suspended were Justices Chika Okoli (Anambra), Ya’u Dakwang (Plateau) and both the Chief Judge of Ekiti State, Justice Kayode Bamisile and the former acting Chief Judge of the state, Justice Jide Aladejana. Justice Bamisile was accused of allegedly compromising himself by appointing on the investigation panel, persons believed to be cronies of suspended Governor Ayodele Fayose, to probe the alleged misconduct of the governor. Bamisile’s suspension by the NJC, under chairmanship of former Chief Justice of Nigeria (CJN), Justice Alfa Belgore, was pursuant to a petition written by some concerned senior lawyers of Ekiti State. Consequent upon his suspension vide a letter addressed to him and signed by Justice Belgore (rtd), the NJC removed his name from the payroll and stopped payment of his salaries, emoluments, allowances and other perquisites of his office. Not satisfied by the decision of the Council, Justice Bamisile filed an originating summons challenging his suspension by the NJC and removal of his name from its payroll. He also held that under the provisions of section 292 of the constitution of the Federal Republic of Nigeria of 1999, the NJC cannot solely remove the plaintiff as the Chief Judge of Ekiti State. Justice Akanbi, however, held: “I am unable to declare that the plaintiff has been wrongfully and unconstitutional removed from office as a judicial officer by the 1st defendant. I also refuse an order nullifying the plaintiff’s suspension from office as a serving judicial officer. Equally refused is an order of injunction against the defendants.” Also not satisfied with certain aspects of the decision, Justice Bamisile further approached the Akure division of the Court of Appeal against the judgement of the Federal High Court. In his six grounds of appeal, he specifically challenged the failure by the trial court to nullify his suspension by the NJC and to also order the payment of his salaries and other emoluments in view of its finding that he is still in the judicial service of Ekiti State. Before the Court of Appeal, the NJC also cross-appealed against part of the decision of the trial court. In its judgement, a threeman panel of the Court of Appeal, led by Justice Kudirat Kekere-Ekun (now a Justice of the Supreme Court), held that the trial court was correct in refusing to nullify the suspension. However, the Court of Appeal held that: “In the case of the appellant, by his suspension, did not cease to be a judicial officer until the governor accepted and acted upon the 1st respondent’s recommendation. Having resolved the above issue in favour of the appellant, the Court of Appeal ordered the NJC to pay his salaries, emoluments and other entitlements from December 21, 2006 till date of the judgement and thereafter, until the Governor of Ekiti State takes a final decision on its recommendation for his removal from office. Other members of the panel who agreed with the lead judgement were Justices Chinwe Iyizoba and Moore Adumein. 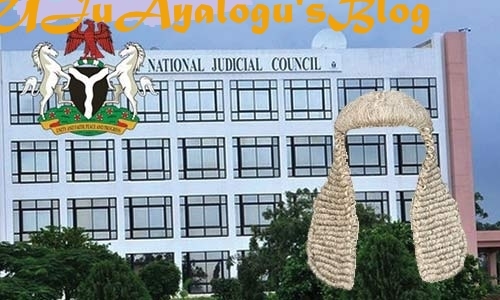 The Council had, however, asked the apex court to determine whether section 292(b) and paragraph 21 (d) of the Third schedule to the 1999 Constitution (as amended) subjected the undoubted power of the NJC to discipline judicial officers to the whims and caprices of governors. It further wants the court to determine whether a governor could say ‘no’ to disciplinary sanctions meted out to a judicial officer by the NJC. In addition, it prays the court to decide whether the judgement of the court is not a violent assault on the principles of separation of powers by purporting to subject the decisions of the NJC to the executive arm of government. The Council is also seeking an order extending the time within which the applicant may seek leave to appeal against the judgement of the Court of Appeal, Akure Division delivered on January 13, 2012 in appeal no: CA/B/223/08 between Hon. Justice Kayode Bamisile Vs NJC and three others. It also wants an order granting leave to appeal against the said judgement of the appellate court. The NJC further asked for leave to appeal against the judgement on grounds of fact and mixed law as well as to raise issues not raised in the court below.